Star soprano Anna Netrebko adds Donizetti’s hapless heroine to her growing list of Met triumphs in this production by Mary Zimmerman that updates the events to the 19th century. Rising young tenor sensation Piotr Beczała is Edgardo and Mariusz Kwiecien plays Lucia’s brother Enrico whose brutal authority forces her to deny her heart and marry for the sake of her family. 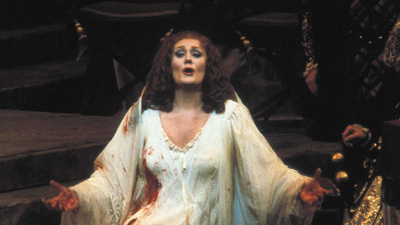 The famous mad scene brilliantly depicts the cascading fragments of Lucia’s disintegrating mind.